Officers of the Martin Police Department responded to Sudden Service Quick Stop (509 N. Lindell St.) at 1:49 a.m. on 5/9/18 in reference to a burglar alarm. They discovered that a rear door was open and that several items were missing from the store. Shortly after, a suspect was identified. 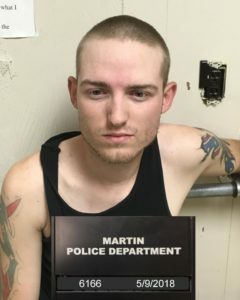 Officers performed a search of the residence of Sean G. Jackson, 23 of Martin where several of the missing items were located inside the suspect’s residence. The offender did admit to breaking into the store, taking several items and damaging other merchandise. Officers also answered four other calls in the area of Maywood Dr. pertaining to damage to the tires on four different cars. It was determined that Mr. Jackson was also responsible for these offenses as well. If there are any residents that have discovered damage or theft in the area of Maywood Dr. or North Lindell St., please contact the Martin P.D. to file reports. Mr. Jackson will be arraigned in Weakley County General Sessions Court today at 2:00 p.m. for 4 counts of Vandalism, Burglary and Theft.